It was a quick turnaround between Friday night’s game and Saturday’s matinee. I got up at 9:00 and worked on the blog until we had to leave at 11:20. Victoria had driven up on Friday and hung out with Amber, who with her fiancé Chris is serving as our host for the weekend. Victoria joined me for Saturday’s game, and it was HOT. We were expecting some rain, but besides a few drops we remained dry. We pulled into a free parking spot that Chris told us about, and made our way towards Target Field. We walked over a bridge and beneath us were some train tracks and a nice bike trail. Chris had told us that there’s a fenced in area that the Twins use to protect sod for replacing grass on the field. I had walked past it on Friday and wasn’t the wiser. You can see that they’ve already removed some, and they have a small warning track that goes around the grass. Walking up the sidewalk to the right of the replacement grass leads you (obviously) to the stadium. 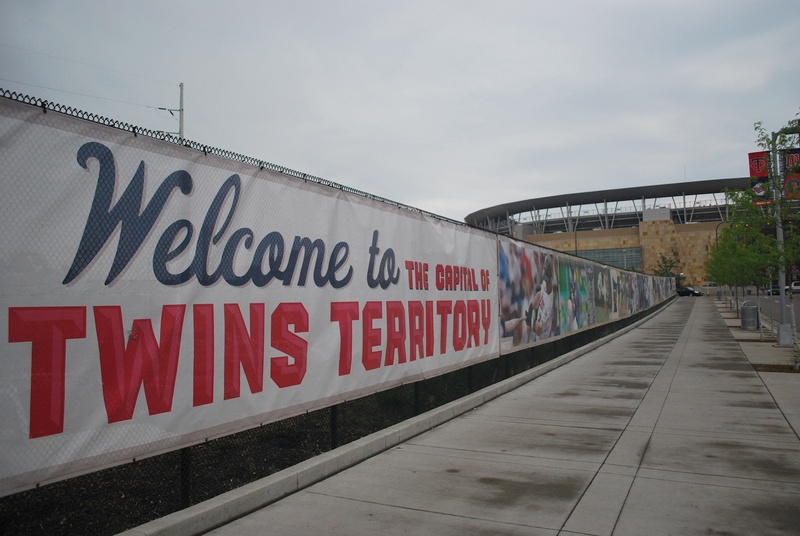 They have some banners on the fence that you pass along the way. 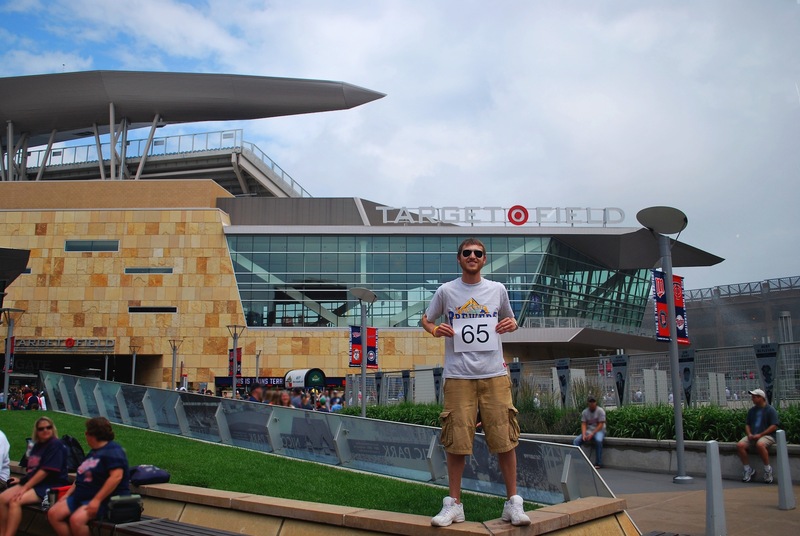 Once we crossed the street we took a left and walked completely around Target Field. 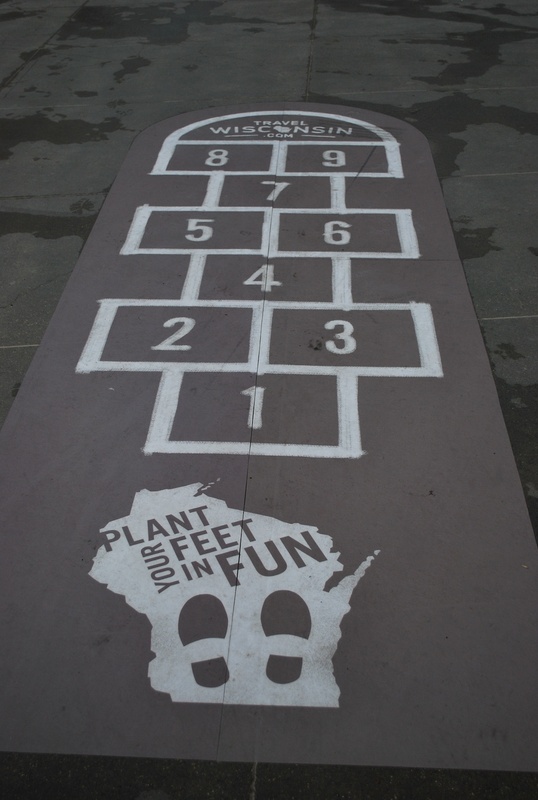 There was some cool stuff along the way, including TravelWisconsin.com hop scotch! Victoria tried it out and said that it indeed was hop scotch. I wonder how much Travel Wisconsin had to pay for these (there were a few). I DON’T think it’s some sort of reciprocity agreement because there isn’t anything like this at Miller Park, at least that I’m aware of. 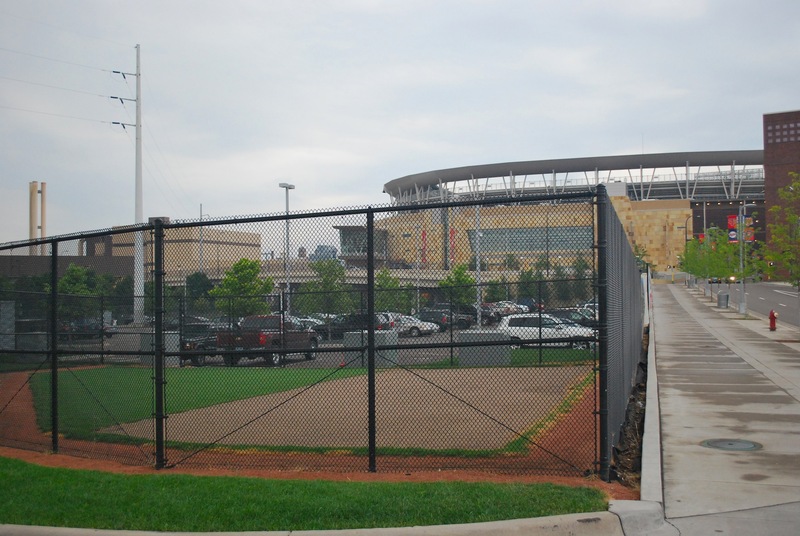 1) The home plate side of the stadium, there’s a factory on the other side of the fence on the left there. Because of how the park had to be situated to fit on the plot of land made it impossible to have a grandiose home plate entrance. 2) A Twins logo on a bike rack. 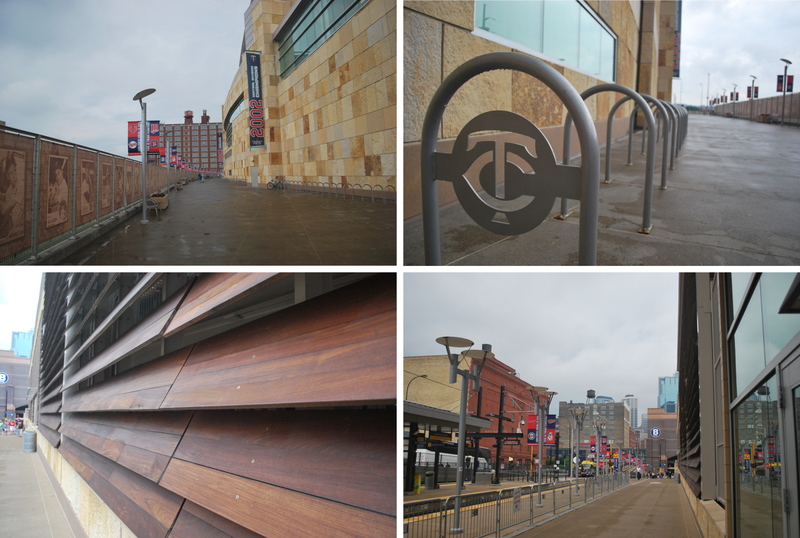 They have lots of bike racks around Target Field, and it’s well done. I *wish* I could just ride my bike to Miller Park. I’m not complaining that Miller Park doesn’t have bike racks, because they do, I’m just saying I don’t live close enough to bike there. 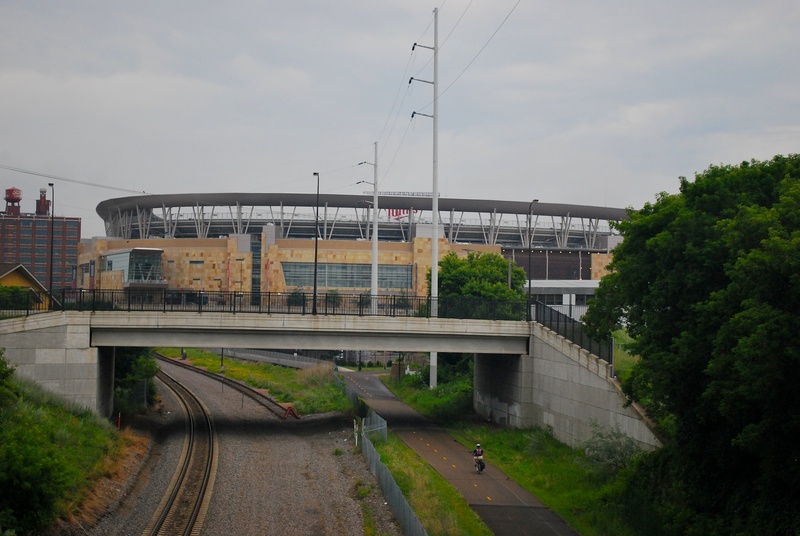 3) The exterior of the third base side of the stadium, with a light rail car in the distance. 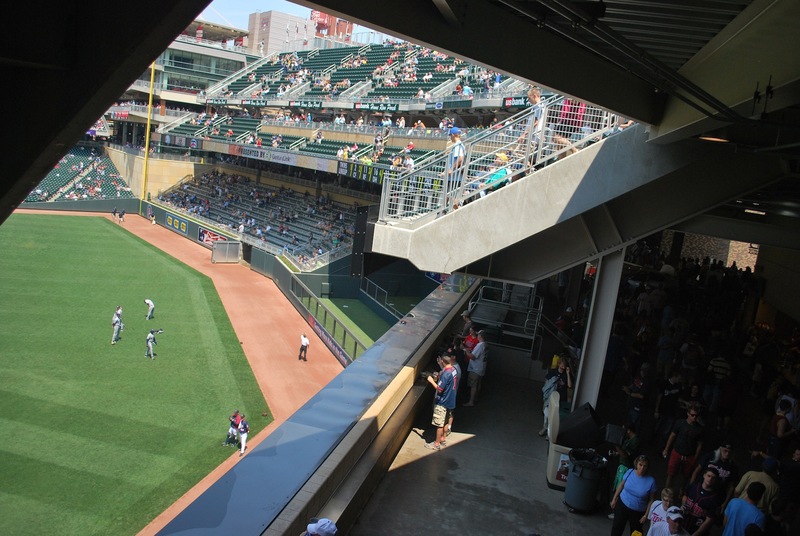 The train stop is feet from Target Field, and they did a nice job with it. 4) A close-up of the wood panels that are incorporated into the design of the stadium. After making our way around the stadium we stopped outside gate 29 for game photo number 65. 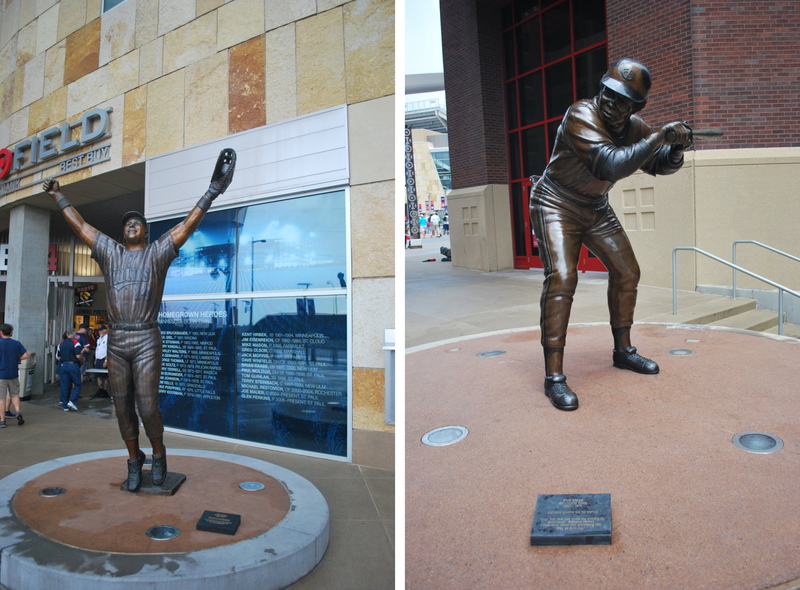 There are five statues of Twins legends outside of the stadium, and I saw two of them. Chris informed me that the other three are Oliva, Pucket, and Killebrew. Below you have Kent Hrbek on the left (with the Twins from 1981 to 1994), and Rod Carew on the right (1967-1978). 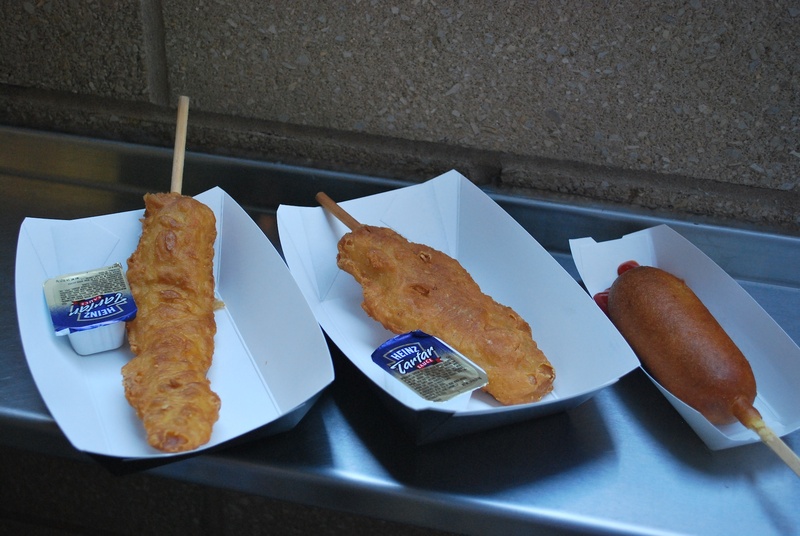 The Walleye on a stick sets you back $11 a piece, and the corn dog was $4. They charge you $1.50 for a corn dog at Chase Field in Phoenix. I’m guessing a walleye on a stick would be about the same at Miller Park, because most all stadiums have extremely high prices, but $11 seemed really high. I think if it came with fries or something then $11 would be an acceptable price tag (in a ballpark). Our food was on a counter that faces the field when I took the photo. In the picture below you can see the people standing up against the counter. The thing on the other side of the counter is the batter’s eye. 1) Braun touching second base after his home run to right-centerfield. 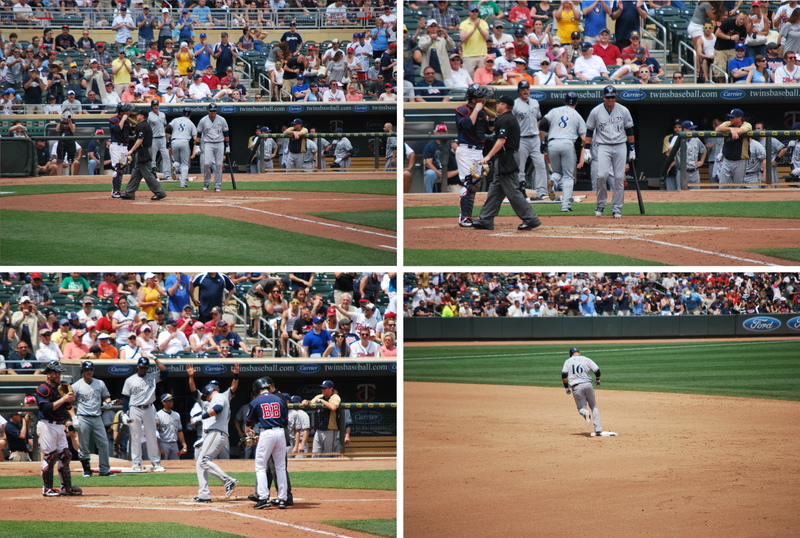 4) Ramirez as he steps on home plate, giving the Brewers a 4-0 lead. 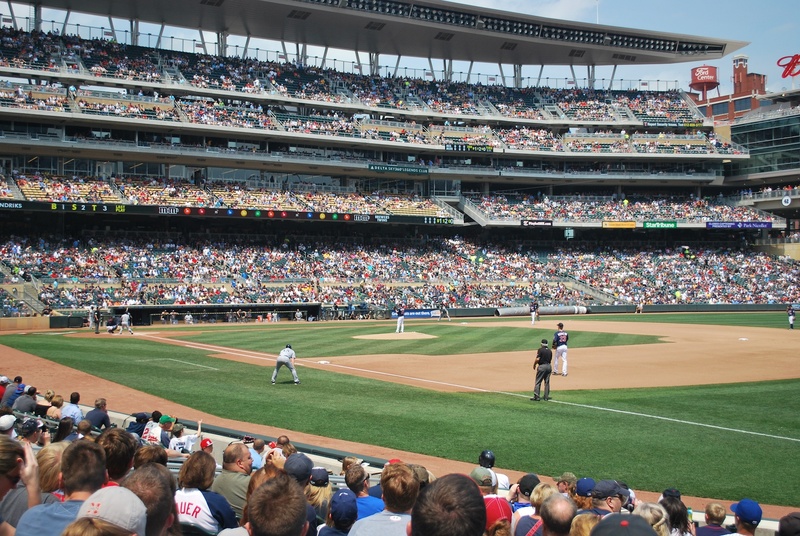 The Twins got one run back in the bottom of the third inning. The Brewers came back with solo runs in the fifth and sixth on home runs by Braun and Ransom, respectively. In the seventh, Braun came to the plate with a chance to give himself a second three homer day of the season. All he did was hit a measly double to left center, which gave him 10 total bases on the day. Here he is sliding into second. 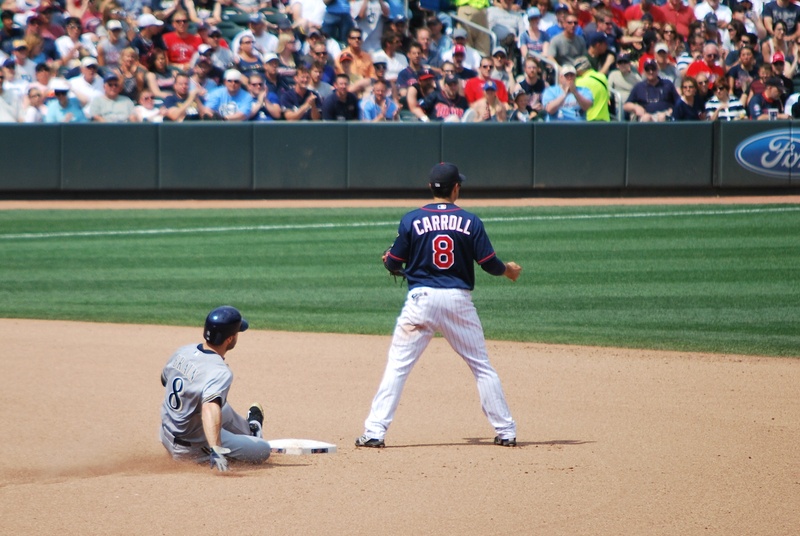 The Twins put a meaningless run on the board in the eighth, and that concluded the scoring. 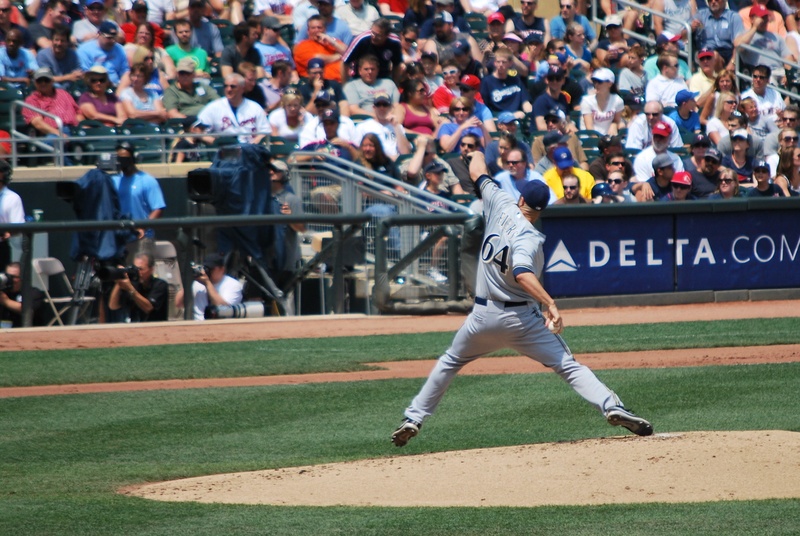 Final Score: Brewers 6 – Twins 2. Fiers pitched great for the Brewers, and deserves a shout out and a picture. He hides the ball well (as you can see), and I think that is playing a role in his early success in the bigs. A 3.60 ERA isn’t the greatest, but he’s definitely held his own and is doing his part. He finished the day with 7 innings pitched, 1 run on 4 hits and 2 walks, and he struck out 5. Victoria had recorded my interview with Craig Coshun from Wednesday’s game in Kansas City. I’ve included it below for your viewing (dis)pleasure. Check out the other camera guy photo bombing the first millisecond. 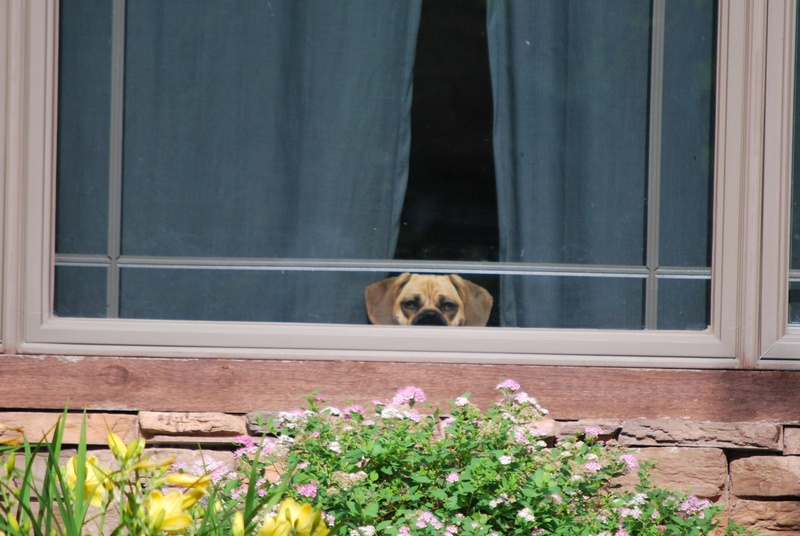 That is Henry, Chris and Amber’s Puggle. He’s a very friendly one-year-old puppy, but he’s got some daggers for claws. When Chris and Amber got home from the Graduation party they were attending we grilled out for dinner, and I added another Bratwurst to the sausage tally. I’ll be leaving for the game at around 11:00 tomorrow, and I’m looking forward to seeing Greinke on the mound for the second time on the road trip. I know this means he won’t be pitching at home Monday through Wednesday, where he’s undefeated as a Brewer, but you can’t hold someone back because of home-away splits.